As part of the Flesh Tearer squad I'm working on, there is a Librarian that goes along with them. Part of a Librarian is the psychic hood. Modeling, Painting and Gaming was kind enough to share their process here on FTW a while ago. The original psychic hood post/tutorial was posted and I never thought much of it since I'd already developed my own style of building them. Until this project came along. I thought I would try my hand at it to see what I could come up with for this guy since the model lent itself to this approach more than it did my usual method. The tutorial works and works well. There are a few things you need to make sure you do in order to get the most from your results. Making sure that you torso is cleaned off completely and is as level as you can get it is important. You want to have a good surface to be able to mount to the hood to. Cutting the actual hood from a regular shoulderpad can be tricky. The step by step is good and shows you how to start the whole process. The hardest part is making sure you do not cut too much off one side. It's a constant struggle to keep both sides even and lined up. If you're patient though, it pays off in about 15 minutes of careful trimming. 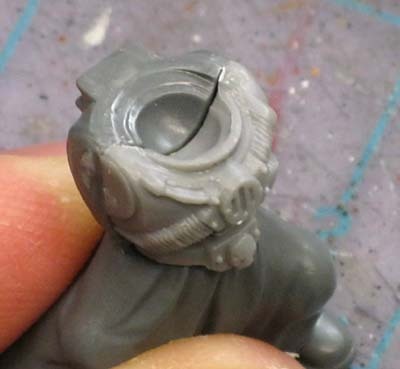 One other consideration is the head that is going in there. I'm sure most will fit, but it's worth doing a test fit of the head and hood together before gluing anything in place. You don't want to discover you can't finish assembling your model because something doesn't fit now. With the shell of the hood built (cut out and glued in place), it's a matter of adding those few additional elements like power cables to really seal the deal and make it all convincing. Here's the finished Librarian model here. He looks very much the part, great work! Geek: Thanks! I've got to iron out the paint scheme for this guy since it will involve blue, but I'll be posting the scheme for the other guys in the next day or so. Lloyd: It was, I can see how using some Grey Knight parts might make it even easier now. Still... it's another method to get something built and creating a new look for a model. I appreciate you sharing it. 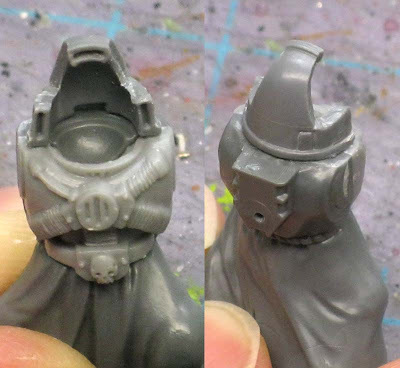 I realy like the idea of cutting down a shoulder pad! I may have to try that out as I don't much care for any of the Librarian models. Can't believe I never thought of using a shoulderpad for psychic hood - great tip! Wow. I am glad I found this! I've been wanting to build a custom Librarian as I am not a fan of the open face versions available. 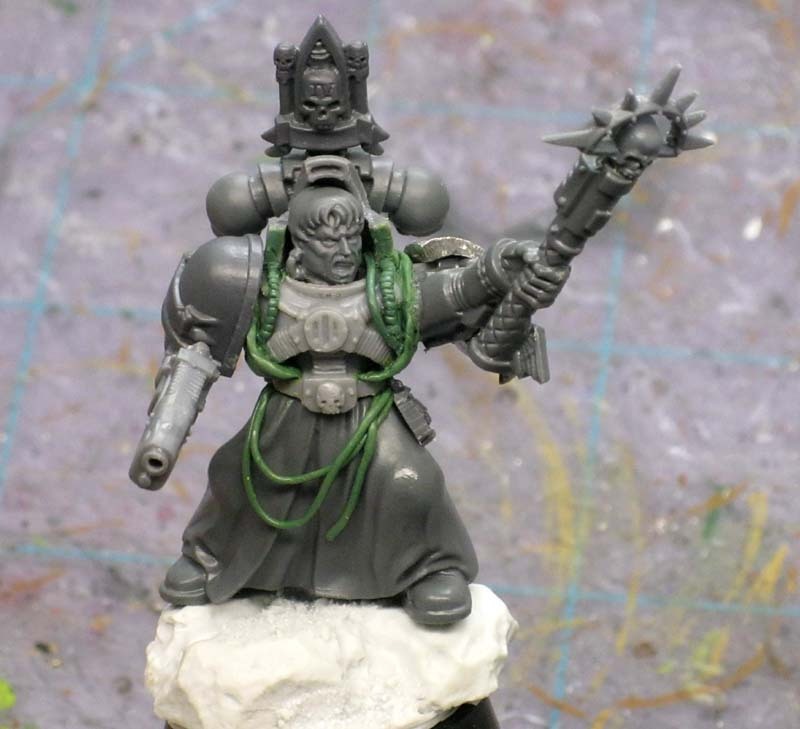 My entire army is close helm and I want to redo a Librarian with the same effect so thank you! Well I certainly can't take credit for the idea guys, I'm just passing along my results using a technique that was shared a while back. I am glad that it is helping a number of folks though, it's nice to know that the stuff here is put to good use. Excellent bits choices. I never thought of using a shoulder pad to make a hood!